I hope you all had an absolutely wonderful holiday and have started off 2015 with a bang! The beau, pups and I thoroughly enjoyed our time off and were actually able to kick off and *almost* finish a few projects around the house. I hope to show off some of our masterpieces some time this year- bad bad blogger! If you're new 'round here, Brynne from The Gathered Home, Cassie from Primitive and Proper, and Corinna from For My Love Of, along with our surprise guest poster: Gretchen from Boxy Colonial, invite you to hang out with us on Instagram. 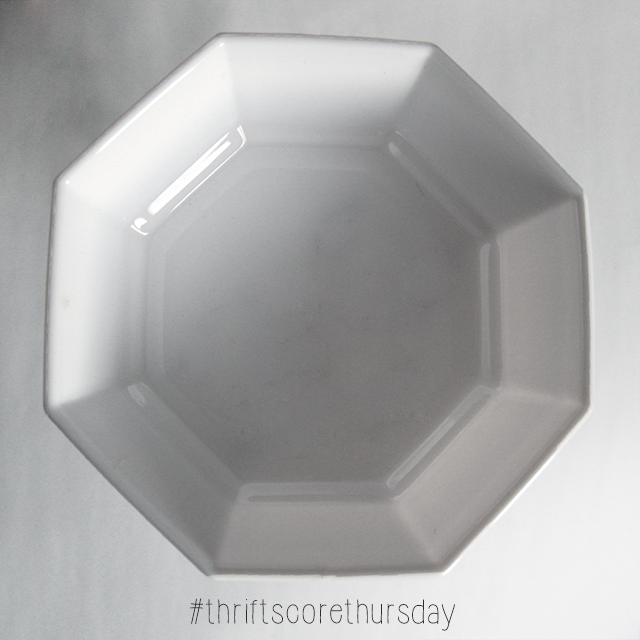 Simply snap a pic of your thrifted treasure and throw the #thriftscorethursday hashtag so we can all marvel at your goodies. 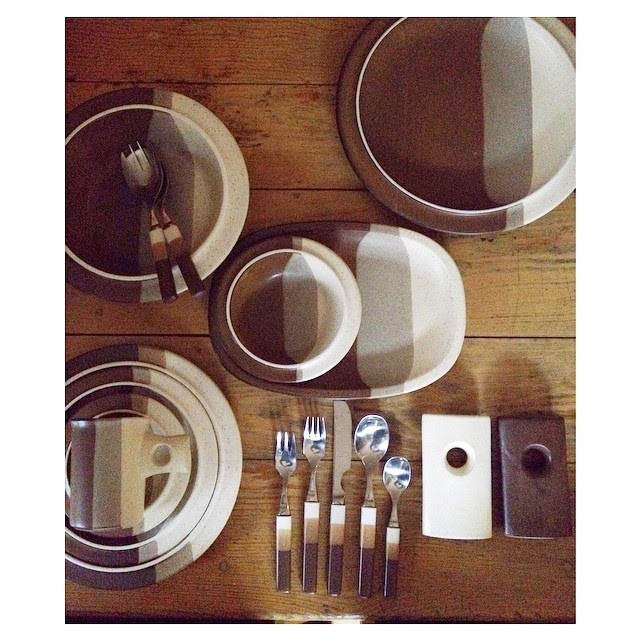 Jennifer scored this absolutely lovely and impressive Denby England Touchstone set. I'm really digging the gradients and the handmade look of the glazed pieces. Don't you think they'd be perfect as a vintage travel trailer table setting?! Umm $1.65 for this Brass light-thing-a-ma-gig?! Heck yes. 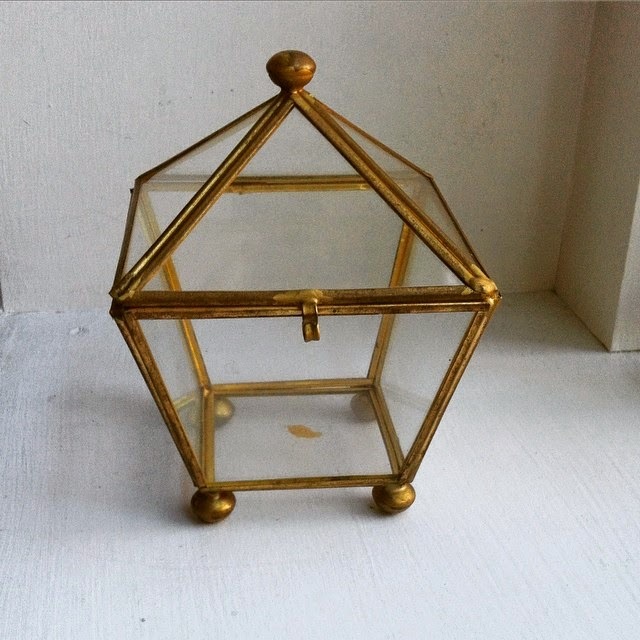 I would use as Terrarium, complete with a cute little secret garden. Because everything is far cuter in it's mini-form. Don't believe me? Search "Clay Charms" on Etsy. Watch your pocketbook, you're welcome. Alright 1. I'm super excited that Sammi from Every Home is a Castle (remember her sunburst tutorial?) 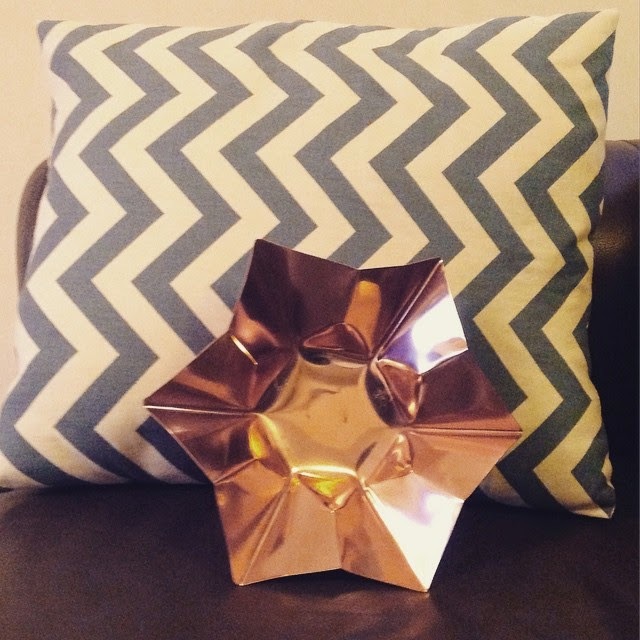 has finally hopped on the Instagram Train and 2. how absolutely adorable is this geometric-ish Bronze Dish?! Love it!! When I dug up this sweet Octagon (cereal) Bowl underneath a pile of sad off-beat dishes I knew it had to be MINE. Ok, so the 50 cent price tag was also screaming "BUY ME!" Immediately I knew it would serve a new life as a mini-jewelry dish. Like most women, I have this awful habit of taking off my jewelry after a long day at work and randomly tossing them on practically any flat surface. More often than not, those piles resemble a bread crumb trail, except less bread and more jewels. Anywho, I've already added made some slight modifications to this little guy (one of the mini-projects tackled on our holiday break). I cannot wait to show you the transformation and how easy it was! Now it's your turn, did you do some thrifting over the holidays? Do Share!! >>>Looking for even more amazing thrift scores? Pop by Brynne, Cassie, Corinna & this week’s guest host: Gretchen to see what they found this week (by clicking the images below). Sweet score with the octagon dish! I can't wait to see the modification. I do wish thrift stores were a bit better about showcasing their stock. I just know I would've missed this beauty trying to rush my 2 year old through the store. Oh heck yes, they'd probably sell more if they made pretty displays! P.S. I'd totally volunteer for that role!! it's perfect for jewelry! i love it! and i have to be honest my head is in football mode with all the college bowls that just happened so i was like octagon bowl.... i haven't heard of that one. NEED MORE COFFEE. and love that denby set! WHOA. I'm awful at following along with football, but I'd probably go just to see an octagon bowl ha! brass light thing-a-ma-jig--love it! And great find on the octagon bowl; octagons are the new hexagons! Super fun! I'm the worst at leaving my jewelry scattered throughout the house (oh and hair ties and pins - don't get me started)! I love little bowls for corralling them! These are just things we don't speak about. They go to die with mis-matched socks. Thanks Trisha for spotlighting my new find :) I've added a few things to it - and just need to photograph it.